You can get some really nice deals on longer subscriptions in Discount Magazines weekend sale. 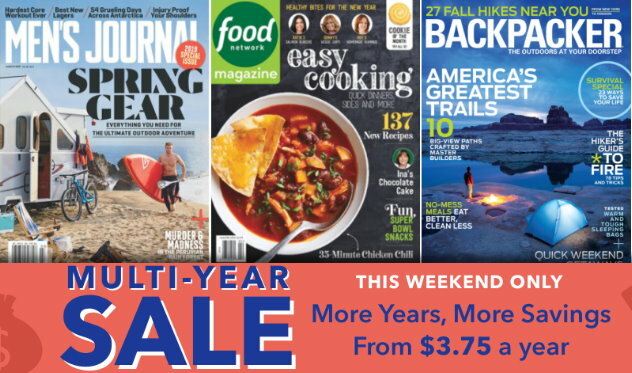 Just as an example you can get a 1 year subscription to Food Network magazine for $7.95 – but a 2 year subscription is $14.95 ($7.47 per year), a 3 year subscription is $21.95 ($7.31 per year), and a 4 year subscription is $28.95 ($7.23 per year). The more years you buy – the better the rate! No code is needed just click on this link and the discount will show up at checkout. There are quite a few other titles included as well – Taste of Home, Diabetes Self Management, Discover, HGTV, Jack & Jill, Vacations, Cosmopolitan and more. Just go HERE to check out all the sale titles that are included. And, keep in mind with Discount Mags there is NO auto renew and shipping is FREE! This sale expires at 11:59 PM EST April 15th.